Parle tu Francais? Tu ?™tre int?©ress?© par le empereur Napoleon Bonaparte? ^ I strongly suppose I messed up even that dictionary supported attempt at the French language, but from next week on I will attend courses to acquire at least a basic knowledge of French and Spanish. It would be really awesome if sometimes I could try to talk in one of the two languages to someone who knows them. Are you interested in Napoleon Vek? I am interessed in history in general, particulary the great empires and the great emperors. I dont know much about all the dates and names, but if i see a documentary about this on television or an article on internet i'll watch/read it whenever i can. The Byzantine Empire, Russian Empire and Roman Empire are my favorites subjects. The thing that attract me in an empire ( real or fictional ), its the high level of technology used, the mentality and the age. Byzantine Empire was a 1000 years old empire at his end, French Empire was like 10 years old at his end... I dont really like those kind of ephemeral empires and emperors. An perfect exemple of civilisation ( fictionnal ) that i love: The Ancients in Stargate. A millions years old civilisation, highest technology, and a pacifist mentality. We could say this if i was living in Quebec City ( our capital ). But i don't, so when talking about the province of Quebec, we must say: Il habite au Quebec. That's how we make the difference and avoid to be confused. Phew, i am not a teacher, so it's hard to explain that with words, even more in english. Tu ?™tre int?©ress?© par le empereur Napoleon Bonaparte? Tu ’tre intËressÈ = You be interessed. The correct sentence is: " Es-tu ( are you ) intËressÈ par l'Empereur NapolÈon Bonaparte ? " 'Sup old topic? How would you feel when I revived you, huh? Ok so I decided to give the current Fanart prompt a shot with a movie poster. Attached! Don't want to draw posters for every movie? Quote from: Sneak on January 12, 2019, 05:34:25 am whoa, I love it! Thanks! Haha, maybe, but this one I had the most inspiration for. Right on! Good to see another person joining in on some of the prompts! The drawing itself is nice and simple so I don't have too much to comment one. The gang and background look nice silhouetted and Guido looks good overall. I'm not sure if his belly is too fat or too long but it looks funny to me and maybe his head feathers could have been maybe thinner and more spread apart? They look a little stuck together. It looks good though and I hope to see you join in on more of these prompts in the future! Oh, that is a pleasant surprise! Also might be the record for the earliest submission up to date haha. It's looking really nice! Yep, this is a really cool drawing. The idea is quite cool and the colors and the feeling of this picture are quite impressive. I also like the layout as it makes this look more poster-like. However, Guido looks a bit simple and I'd say his lower body and especially his legs are too thin. But other than that, nice job here. 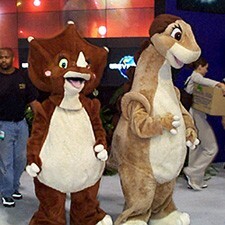 When thinking of Love and/or Family in the Land Before Time universe, I instantly go to Ducky's family. The love she shows for others has to come from somewhere, and I'm pretty sure her parents must've had a loving relationship as well. We do not see much of Ducky's father in the series, so I'd like to give him the spotlight too. With much love, just a night in the life of these two Bigmouths. Now that I'm back home I should make a proper comment on this. It looks like you like your night scenes! I'd say that this one looks a lot better though! Instead of a silhouette the background seems to have more complicated lighting with the presence of the moon. Both of Ducky's parents look good as well and certainly fits the prompt as well! I'd say that the biggest thing that stands out is that Ducky's dad's neck or the mom's shoulders look a little off. Not sure how to put it, I guess the lines seem to have abrupt changes in direction? Great job with this and I look forward to seeing more art from you in the future! Well, the idea of the picture is quite heartwarming and it is executed decently and there seems to be a pretty good atmosphere too. The background also works but especially the male swimmer's face looks a bit deformed. Both of them could have been drawn better but overall, this is a pretty good picture.